The homeowner wanted the feeling of an open loft-like space that utilized natural light from the large windows at the front and back of the home. 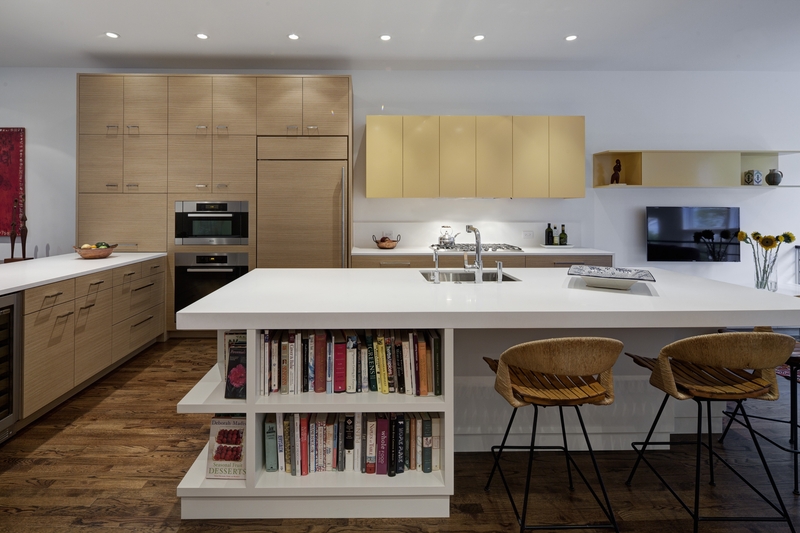 They wanted to remove as many of the first floor walls as possible and let the kitchen space occupy the full width of their typical Chicago row home. 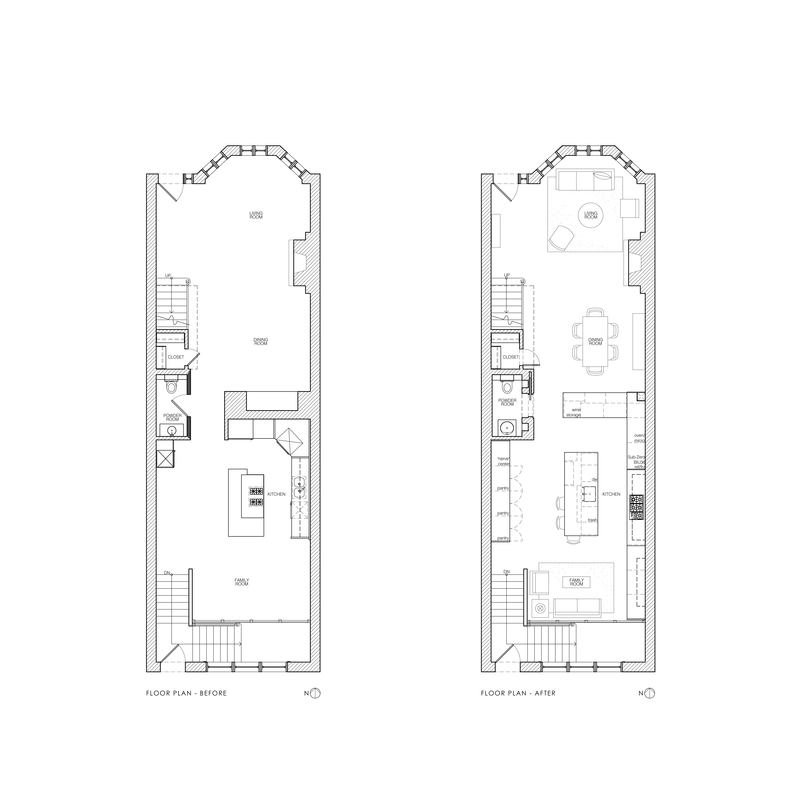 This desire was balanced with a kitchen that functioned for day-to-day cooking, storing, and entertaining. Removing the interior walls required all of the mechanical systems to be rerouted from the basement up through the first floor to the upper levels. A mechanical chase was hidden in the cabinetry. This ensured that the space was free of soffits and other visual impairments that would interrupt the open and clean aesthetic. Using the full width of the building allowed the sculptural asymmetrical island to occupy the center of the home. Wrapping cookbook storage around one corner of the island and seating around the other, the island directs traffic away from the work triangle to the rear of the kitchen open to a family room TV space. 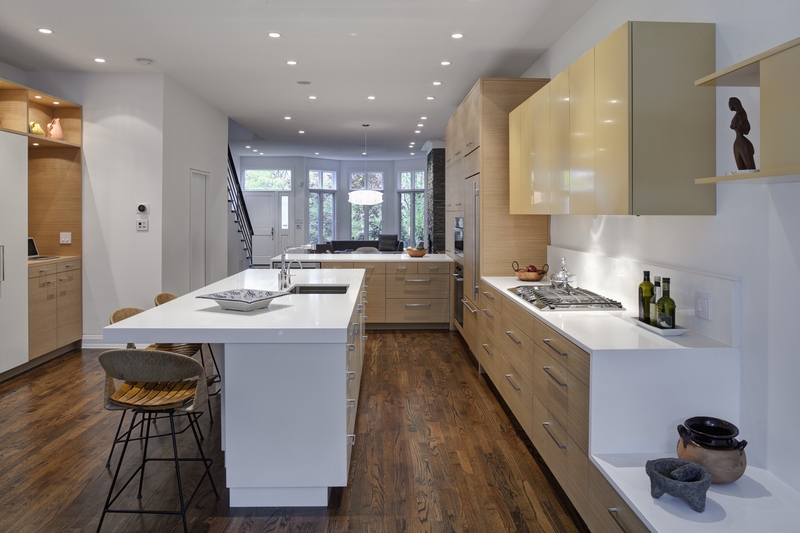 White polished counters, reflective upper cabinets similar in tone to the light colored wood cabinets were used in contrast with the darker wood floor. 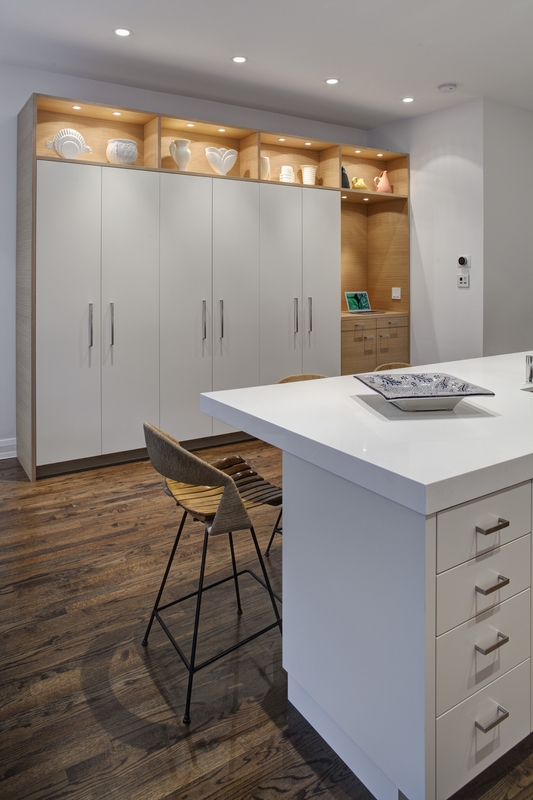 The contrast of the floors and cabinets, along with the light, reflective qualities of the materials allow for maximum light reflection from both natural and artificial light sources. Materials used included ecologically sourced veneers, countertops made from recycled materials, and upgraded mechanical systems made the space more efficient while limiting the project’s environmental impact. This kitchen provides entertaining space clear of the work triangle and a unique mix of materials that allow for an open kitchen that feels warm, bright, contemporary and larger than its actual square footage.